What if I told you there are only a few things you need to make sure you get right in order to create your first homemade soap? I like how The Soap Queen, Anne-Marie Faiola, described how anxious we and our parents are the first time we are being taught how to drive the family car. As time goes by and as we practice, it becomes natural. Well, it’s the same with making homemade soap! When measuring and preparing the ingredients, be exact in the amount called for per ingredient. Discrepancies will throw off the proper ratios between ingredients and lead to either a soft gel-like soap that won’t mold or something that will be hard even before you try to place it in your mold. Repeat after me… add lye… to… water…. never add water… to…. lye. Getting this wrong can and probably WILL result in a dangerous out of control explosion in your house! 🎇 This might be the scary part everyone is nervous about, eh? It’s easy.. Just don’t get it wrong and you’ll be fine. As much as possible, lye water and the oil mixture need to be at the same temperature. We recommend that they are both around 120°F to 130°F. We promise it won’t be hard because you can use our IR thermometer to track this very easily – even hands-free! Count on The Soap Queen to walk us through the basics on how to make homemade soap. I will provide the critical steps included in her 4 part basic soap making video series for you to follow. Make sure you get the measurement of recipes as accurate as you can. The quality of the soap’s final output depends on this ratio. The first video on how to make soap starts by talking about lye safety. She began by showing the effects of lye on a raw chicken skin. Yuck! You can imagine what can happen to your own skin if you’re not careful, or fail to wear your protective gloves! Don’t do that. Wear your gloves! So once you’ve gathered your ingredients, you need to get yourself some protective gear. While working with lye, you need to wear safety glasses, protective gloves, long sleeves, and long pants. If you’re sensitive to fumes, you can wear a dust mask as well. Once you’re completely protected, you can start slowly adding the lye to the water while mixing. Again, never add water to lye. Mix the lye water solution until no residue is left. The water will become cloudy but set it aside first while the water becomes clear again. You’ll notice that the lye water will heat up because of a chemical reaction. Don’t touch the liquid! It’s hot and may reach up to 200°F! Slowly add lye to water. Mix while adding. After mixing, put it aside to cool down while you get and prepare the oil mixtures. Let’s see what the soap queen says as she explains how to prepare our oil mixtures. Oils that are solid at room temperature need to be heated up to become liquid for mixing. Oils that harden at room temperature and lower need to be heated to be in a liquid form for the mixing. In our ingredients list, these are the coconut oil and palm oils. Notice that the soap queen recommends heating all the palm oil and mixing the melted oil within the container before measuring out the amount called for. This is to preserve the fatty acid chains so they are retained in your recipe. In Part 2 of the soap queen’s video series on how to make soap, she explains how the mixing of the lye water and oils leads to a process called saponification and becomes soap. It can be compared to how a blue clay and yellow clay when combined become one larger green clay. Before mixing the lye water and oil mixture, make sure that they are both in the same temperature range (around 120°F to 130°F.) We have mentioned above what may happen if their temperatures are far apart and you already started to mix them. Bottomline, the quality of the soap will not be as close to ideal as you want. To make sure your mixtures are in the same temperature range, the Soap Queen uses a non-contact temp gun. A laser temperature gun makes sure that you get an accurate measurement without the risk of having burns due to the hot lye water and the heated oil mixture. Oh, and we got the perfect infrared thermometer for you! 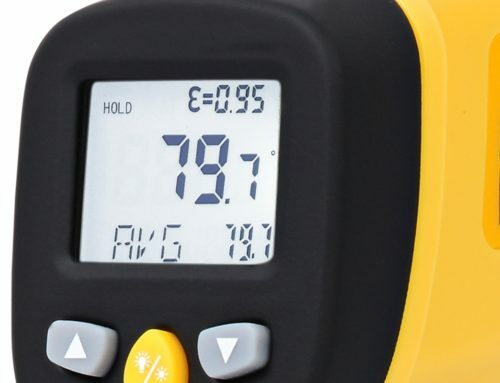 Professional soap makers love how reliable our non-contact temperature gun is! If the oil mixture’s temperature is not in the proper range, heat it up or cool it down. You can scan the oil temperature using your non-contact temperature gun until you get the oil to the right temperature. Let the lye water cool down to the desired temperature range and if the oil mixture temperature is low, heat it up in a microwave. Once both mixtures are in the temperature range of 120°F-130°F you can start mixing them together. The soap queen and other soap making professionals recommend using a handheld stick blender to speed up the mixing process. You’ll know that the mixture has reached the saponification phase when you have “trace” showing up on top of the mixture when you raise the stick blender. It’s called “trace” because it leaves a trace on the mixture and does not immediately disappear back into the surface of the mixture. Depending on the recipe, once you have a light or medium trace, you can add a fragrance oil or essential oil to the soap for an awesome aroma. In this recipe, we didn’t include any scents, so we can skip this part and we can now pour the mixture into the mold. Place silicone or paper linings in the mold so that you can easily remove the soap once it has hardened. Slowly pour the mixture into the mold. Tap the mold a few times to let excess air out. Cover the mold with plastic wrap and then place a towel on top of it to insulate the mold. Without insulation, some flakes or ashes may form on top of the mold that you might need to remove. Insulation is critical for the quality of your soap coming out of the mold. Let the mold sit for 24 hours. It should be hard now and easily removable from the mold. Your soap is now ready for cutting. The mold looks like soap now doesn’t it? You’re almost done! But there are a couple more steps before your soap will be ready to use. First, you must cut and cure your soap. Use a kitchen knife to cut the soap into bars for easy curing. Store the blocks of soap on a box or parchment paper covered cookie sheet – a wooden shelf or out of the way clean dry surface can act as a curing rack. Make sure the bars don’t touch and have ample space for air flow between them. The storage area should be well ventilated as well for the soap bars to be cured properly. After 4 to 6 weeks on the curing rack, your soap bars are ready! You can give them as gifts or use them yourself! Now that you know the basics and the most critical elements in soap making at home, it’s time to make some soap! Make sure you have a reliable non-contact thermometer to keep track of those all-important temperature measurements in the soap making process!